Come enjoy an evening of traditional music from Ireland and beyond with the trio Kibling Hill. 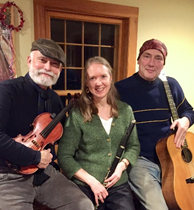 Local musicians Rachel Clark, Rob DeMarco, and George White are all veterans of the VT/New England folk music scene and have recently combined to bring you new favorites on fiddle, wooden flute, guitar and vocals. Suggested donation of $15.00 in advance or $15.00 at the door.However, any amount of donation is acceptable, including zero. We want anyone who would enjoy this concert to attend. Money concerns should not keep anyone away! Garnet Rogers has established himself as one of the major talents of our time. Hailed by the Boston Globe as a charismatic performer and singer, Garnet is a man with a powerful physical presence — close to six and a half feet tall — and a voice to match. With his smooth, dark baritone (Washington Post), his incredible range, and thoughtful, dramatic phrasing, Garnet is widely considered by fans and critics alike to be one of the finest singers anywhere. His music, like the man himself, is literate, passionate, highly sensitive, and deeply purposeful. Cinematic in detail, his songs give expression to the unspoken vocabulary of the heart (Kitchener Waterloo Record). An optimist at heart, Garnet sings extraordinary songs about people who are not obvious heroes and of the small victories of the everyday. As memorable as his songs, his over-the-top humour and lightning-quick wit moves his audience from tears to laughter and back again. Musician, painter and educator Natalia Zukerman grew up in New York City, studied art at Oberlin, started her mural business Off The Wall in San Francisco, began her songwriting career in Boston, and now resides, writes, plays, teaches and paints in Brooklyn, NY. Throughout her career as a touring musician, she has accompanied and opened for some of acoustic music’s greats such as Janis Ian, Willy Porter, Susan Werner, Erin McKeown, Shawn Colvin, Ani DiFranco, Richard Thompson, Tom Paxton and many others. A prolific lyricist and composer, Crys Matthews has found inspiration in her surroundings: from driving through the Blue Ridge Mountains to the compelling and heart-breaking love story of Richard and Mildred Loving. Thoughtful, realistic and emotional, Matthews’ songs speak to the voice of our generation and remind us why music indeed soothes the soul. $20.00 in advance; $25.00 at the door. Laurel grew up at UUCUV, the daughter of members Dan Mendelsohn and Nancy Mentin. She is currently a Junior at Keene State, majoring in music and vocal performance. Growing up in UUCUV, she often sang for our community at Sunday’s services and on other occasions. She had a lovely voice then, and her talent has blossomed. She will grace us with her beautiful soprano voice, singing songs in English, French, German, and Finnish. Tyler is a classmate at Keene who sings, acts, composes and directs. Laurel and Tyler sang this program on April 6 for their Junior recital. “What do you say, old friend, are we or are we unique?” So runs the lyric of Stephen Sondheim’s “Old Friends” (Merrily We Roll Along), the song that, in combination with Paul Simon’s “Old Friends,” served as the opening number of A Fine Bromance, the new show by Bob Wetzel and Craig Becker presented by Mariposa Artists. It was a perfect choice because, while their decades-long friendship may not be unique, it is, at least, rare. And it informed every minute of this unfailingly charming evening. So begins a review of A Fine Bromance in Cabaret Scenes: the Only International Cabaret Magazine. 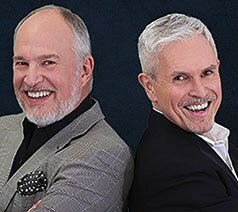 Decades-long friends, Wetzel and Becker mix show tunes, Great American Songbook standards, and pop tunes by such artists as James Taylor and Paul Simon into an arresting evening of bravura cabaret.